Aneurysms can occur along the entire length of the aorta, most commonly in the infrarenal region. Ultrasound screening is an effective and economical means of preventing aortic aneurysm rupture. The indication for repair includes either symptomatic aneurysms or aneurysms with a diameter greater than 5.4 cm. Treatment options for the repair of infrarenal AAAs are open surgical repair (OSR) and endovascular aneurysm repair (EVAR). 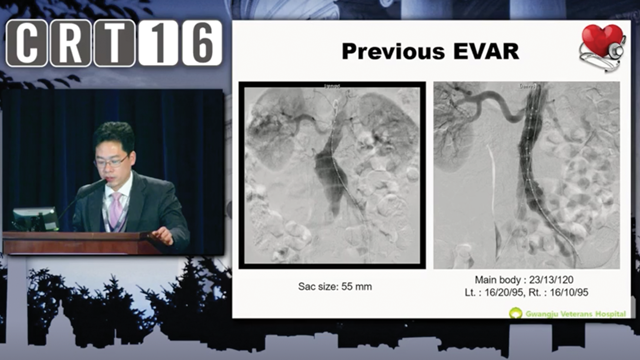 Currently, EVAR is the primary treatment method for the repair of infrarenal AAAs due to improved short-term morbidity and mortality outcomes. Eur J Vasc Endovasc Surg. 2017 Nov 17. pii: S1078-5884(17)30645-7. J Vasc Surg. 2017 Oct;66(4):1028-1036.e18. J Vasc Surg. 2017 Sep 22. pii: S0741-5214(17)31930-4. Ann Vasc Surg. 2017 Sep 22. pii: S0890-5096(17)31005-1. Eur J Vasc Endovasc Surg. 2015 Aug;50(2):157-64. J Vasc Surg. 2013 Apr;57(4):906-14.